Jerr Dan Control Handle Offset Part# 7551000020. Aluminum Control Handle for Standard Duty Carriers and Rollbacks. Hydraulic Function Control Handles. This handle controls the bed tilt & wheelift extend/retract on carriers that have a 4 or 5 control bank. 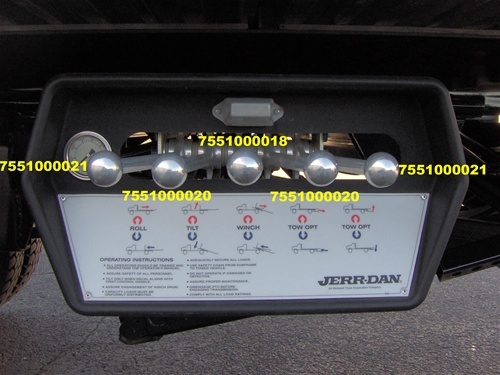 Trucks with 3 control bank (no wheelift), this handle will control the bed tilt.